Texas election officials have acknowledged that hundreds of people were allowed to bypass the state’s toughest-in-the-nation voter ID law and improperly cast ballots in the November presidential election by signing a sworn statement instead of showing a photo ID. The chief election officers in two of the state’s largest counties are now considering whether to refer cases to local prosecutors for potential perjury charges or violations of election law. Officials in many other areas say they will simply let the mistakes go, citing widespread confusion among poll workers and voters. An Associated Press analysis of roughly 13,500 affidavits submitted in Texas’ largest counties found at least 500 instances in which voters were allowed to get around the law by signing an affidavit and never showing a photo ID, despite indicating that they possessed one. Under a court order issued last year, election officials were not allowed to question a voter’s reason for signing an affidavit. The cases do not amount to voter fraud because people still had to be registered to vote to qualify for an affidavit, said John Oldham, Fort Bend County’s elections chief. Poll workers were trained to “err on the side of letting people use the affidavit instead of denying them the chance to vote,” Oldham said. First of all, these were all votes cast by registered voters. 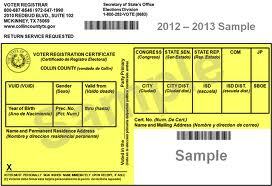 The only impropriety, if there is one, lies in how the court order that “softened” Texas’ voter ID law is interpreted. The affidavit process was to allow registered voters who didn’t have one of the accepted forms of ID to cast their ballot if they produced another form of ID and signed a statement swearing 1) that they were who they said they were, and 2) that they didn’t have an accepted form of ID. Some election officials, like Harris County Clerk Stan Stanart took that to mean that the affiant did not own one of those forms of ID, like a drivers license. Others, including attorneys representing plaintiffs in the ongoing litigation, thought that was too strict. What if someone’s license had been lost or stolen, and they didn’t have the opportunity to get a replacement? What if someone arrived at the polling location only to realize they had left their license at home? Maybe the voters in those situations would be permitted to vote – I certainly think the first group ought to be – but until the question comes before a judge, we’re all just guessing. And remember, we’re talking about a few hundred voters who may not have followed a set of rules that were interpreted in a variety of ways versus sixteen thousand people who got to vote in the first place. Perspective, y’all. The document they signed was called a “Declaration of Reasonable Impediment”. I’m not a lawyer but I take that to mean that the voter is stating that there’s a reason that they are unable to obtain any of the forms of valid ID. In our vindictive political climate, I’d be reluctant to sign something like this that can have multiple interpretations. Tarrant County has given us all an object lesson of what consequences are possible when you fill out and sign a document that you don’t understand. The article was complete BS. The one important quote was buried so I keep seeing this cited as proof of large scale voter fraud in Texas. This has nothing to do, still, with voter impersonation, the ostensible aim at voter ID. There is no evidence that this occurred. The “scandal” is allegedly people said they didn’t have or couldn’t get an ID when they did or could have. It looks like a few people out there refused to show an ID out of protest, and now the Stanarts of the world want to get them for perjury. No doubt lying on a affidavit is illegal, and he people who did that were being stupid, but that is a totally separate thing from voter fraud or impersonation. That said, I am sure voter ID proponents will misleading headline as ammunition.